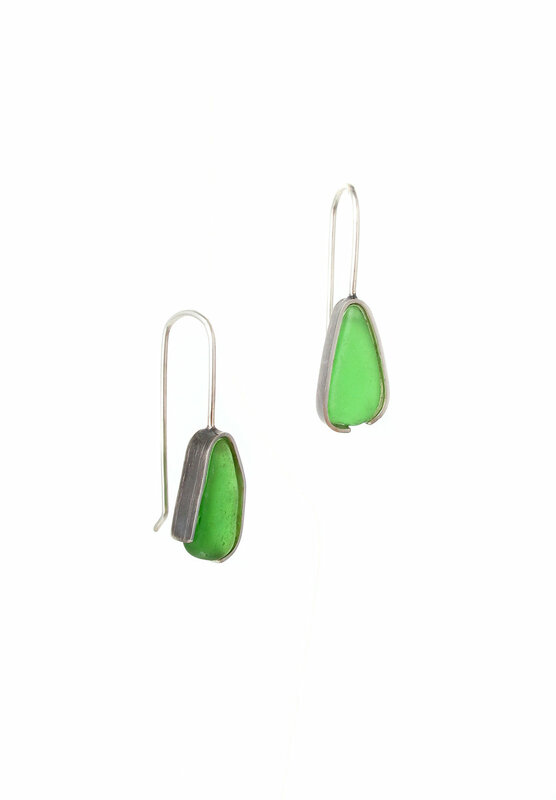 For a good many years now I have been making beach glass jewellery, predominantly earrings. These are now my most popular selling item of all time. 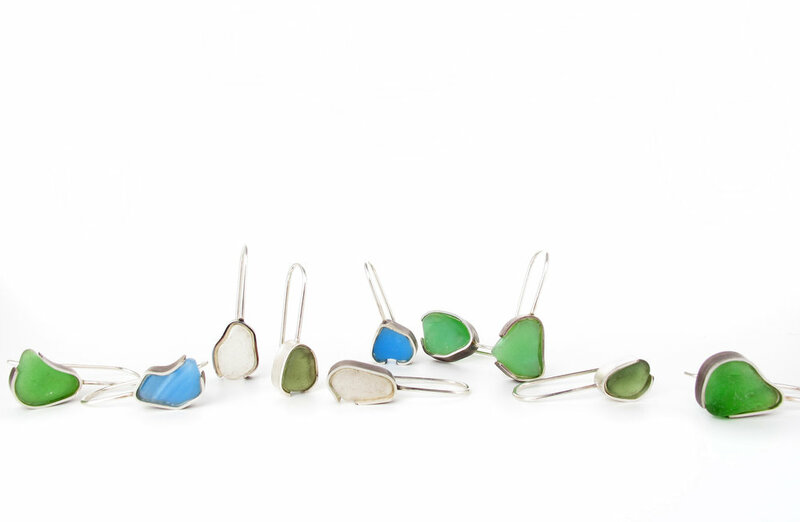 The infatuation for sea glass in me runs deep, there is something so magical about it, and the hunt for it, that I'm forever scouring the beaches in search of that coloured gem. When I first started making jewellery with it, I used a precious personal collection that I had gathered during my time living in Mallorca. After selling out of it, and living in Melbourne at the time, I realised I needed to outsource this precious discarded treasure. Luckily I found and have continued to source it from a beach glass appreciation society based on the West coast of USA. This keeps the demand flowing, and luckily I have also managed a little hoard of my own searching from various parts of the world over the years. Unfortunately the pristine beaches where I live now don't really work in my favour with beach glass but I'm not complaining either! The colours! The colours get me every time. They all have a provenance. Many elements dictate the rarity of them, the area they wash up, the era they were made in, the type of use it had. In fact the details of each colour are a truly fascinating insight into consumer history, oftentimes indicative of the trials and tribulations of the global effects of war, economical depression, and pop culture. There are even rarer colours such as red, yellow, turquoise and black. If this information on colour really interests you, head over to this fantastic Guide to Origin & Rarity and read up. If you have a special piece you've been lucky enough to find and treasure, maybe you'd like to have it made into a pendant or ring perhaps? The best part about these pieces? 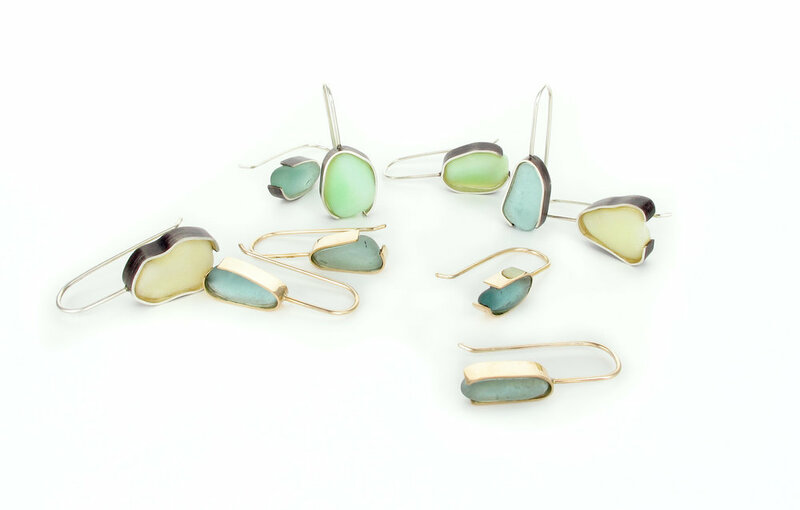 No two are ever the same, yet I continue to be pleasantly surprised at how easy it is to pair up two for a complimentary set of earrings. Just odd enough to be asymmetrical, yet they work perfectly in unison.